Meet Mouse and Mole. They live together in a little cottage in the country. Mouse is practical and cheerful. Mole gets into scrapes and needs looking after. Their everyday adventures will appeal to adults and children alike, because the charm of the stories lies in the endearing friendship of the two central characters and the humour of their exchanges. Mouse and Mole first appeared as an award-winning series on BBC Television, and like The Wind in the Willows and Winnie the Pooh is justly recognised as a classic of our time. 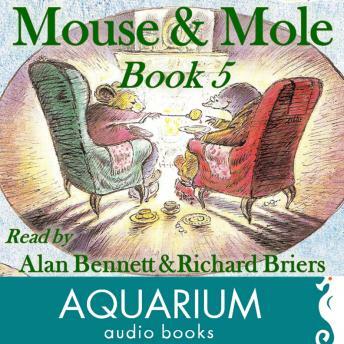 This charming collection of stories features two of Britain's best loved actors, Richard Briers and Alan Bennett, as the voices of Mouse and Mole and of all the supporting characters. Book Five features the stories Snout, Here and There, Last Thoughts, A Rainy Day and What might have Been.